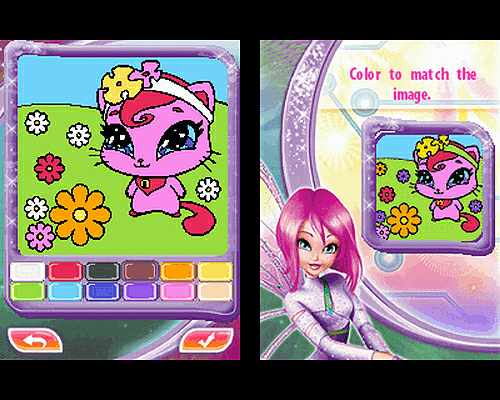 Winx Club: Magical Fairy Party for Nintendo DS lets you create your very own fairy and join the Winx Club. Enrol in the Alfea School for Fairies, and join the girls in the celebrations committee to plan, decorate, and put on some of the best parties Alfea has ever seen! 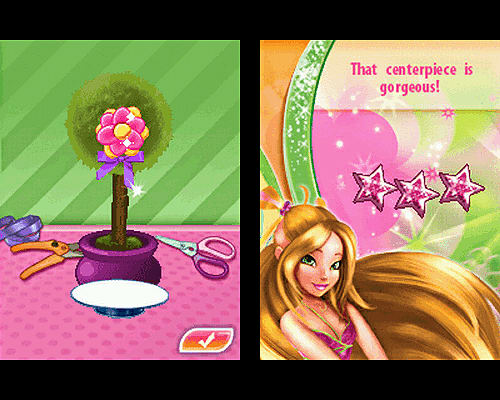 Through a series of creative and casual mini-games set in the school, you will learn and practice magical skills with Bloom, Stella, Flora, and the rest of the Winx Club, as you prepare for each seasonally-themed event. Along the way you’ll have the chance to put your new magic skills to the test as you try to undo the trouble caused by the Trix, rival fairies who'll stop at nothing to put a real damper on any party plans. 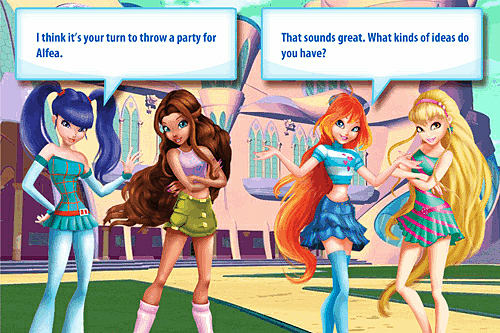 As a new student at Alfea, you’ll quickly befriend the Winx Club and help them on the parties committee. Along the way you can transform into Believix gear to use your Magic in mini-games that’ll help you prepare for the events. As the school year progresses, you’ll join the girls to review how the last event went and decide together on the next event’s theme and timing, culminating in an unforgettable, end-of-year dance - designed by you! Join the Club: Create your own fairy, foster a pet, enrol in Alfea, and earn your spot among the Winx Club! Magic Mini-Games: Transform into Believix gear for replayable mini-games which each contribute to preparing for an event. Each Magic opportunity features 1-2 Winx members as they help you harness Magic towards the event goals. Fashionable Fairies: Customise the look of your fairy with a variety of outfits, accessories, hairstyles, wings, and more! These include school clothes and party outfits, which can be part of the event theme, and unlock throughout progression. Seasonal School Parties: Help the Winx Club fairies with parties they are planning by gathering and placing decorations, planning your outfit, and designing to a theme. 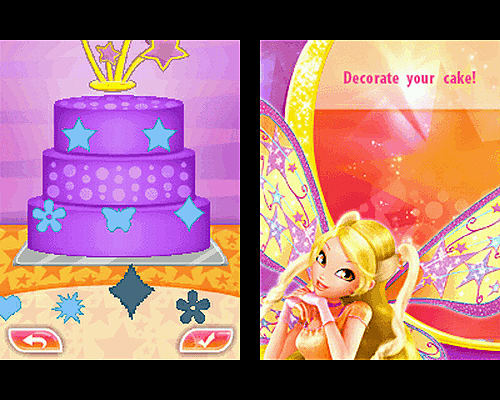 Horoscopes and Birthdays: The Winx and player avatar’s birthdays will be acknowledged during the game utilising the clock, and each chapter or play session will start with a horoscope-like affirmation for the player. Unlockable Rewards: Throughout the game players earn new outfits, accessories, decorations, party music, and more! Trouble-Making Trix: Icy, Stormy and Darcy are at it again, and it’s up to the player to use their Magic to ensure the parties go off without a hitch! 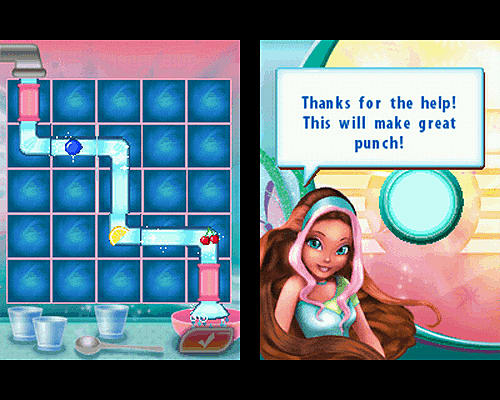 Story Cut Scenes: Key story elements are presented using detailed cut scenes featuring the player character, the Winx Club, and other key characters developing the parties’ themes and planning.